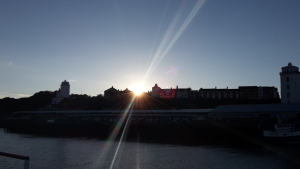 Summer made an appearance in Newcastle, just in time for the Digital Economy Network Summer School 2016, 17-20 July, themed Digital Citizens, Connected Communities. It was a great three days of distinguished keynotes, master classes, student-led workshops and a question and answer session with the keynote speakers on the last day. The social events were held in gorgeous summer weather, which was particularly wonderful for the boat ride down the Tyne on Monday night. how many gamers are female now (45%). Subsequent to these statistics, Mimi addressed issues around enabling and motivating (young) learners in the age of digital technology. Talking about technology use, specifically in the classroom, Mimi emphasised the benefits and practices around connected learning and connected learning environments. Designing for connected learning is one of the big challenges ahead. Technology may support collaborative knowledge generation, but it can equally be a distraction and disruption. We need to consider what connected learning environments need to look like and what they need to provide in order to foster connected learning. In this context technology was talked about as an “educational broker” by providing easy access to resources for young people. Having worked with researchers such as danah boyd, an expert on young people’s lives online, Mimi highlighted the effectiveness of peer-guided mentoring as well as the need to see the changing landscape in educational contexts in and out of school as a real opportunity and not something that negatively impacts on learning. Gaming is the most used type of digital service and we need to create a culture of seeing the opportunities in this for connected learning. A good example for this is Minecraft. One of the challenges Mimi talked about is the problem of matchmaking between experts and young people. The particular part of Mimi’s talk that seemed to resonate with heaps of PhD students at the summer school was on the improved learning outcomes for students when they are being mentored by someone who cares and encourages them. By keeping the research question in mind, the risk of over analysing and ‘over coding’ is mitigated. The final event of the day was Christopher Le Dantec (Georgia Tech) who spoke about his exciting project Cycle Atlanta and civic engagement. Citizens are participating in research and data generation in various ways these days, for example in improving the cycle infrastructure of their city by submitting their GPS logs of frequently cycled routes to an app. The start of the second day saw Brett Scott giving a keynote about global finance and “Hacking the future of money”. One take-home point of the talk was that while we might still just be able to opt out of parts of digital financial systems, the future generations will not have this choice and will be forced to use these systems. A first step towards this can be seen in the current stigmatisation of using cash. Only digital transactions create revenue for the banks – a good reason for banks to incentivise these forms of transactions and (at least perceptional) devaluate the use of hard cash. 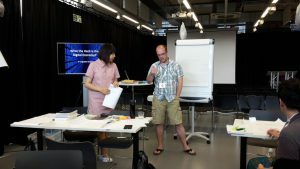 Day two continued with student-led workshops, one of which was delivered by Andrew Moffat (Horizon CDT), Ding Wang (Highwire CDT) and myself. We were very excited to explore “What the heck is the Digital Economy – a linguistic enquiry” with fellow CDT researchers. 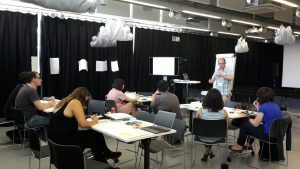 The workshop aimed at providing participants with a ‘linguistic toolbox’ and basic knowledge of Discourse Analysis in order to collaboratively analyse a variety of texts about the Digital Economy (DE) and come up with a DEN manifesto to be distributed to the CDTs. The selected online texts included DE descriptions on the various CDT websites and blurbs by the funding body EPSRC and the UK Parliament. Firstly, all participants provided short definitions of the DE which were discussed and served as a good starting point for the workshop. We then moved on to the mentioned texts and considered more general features such as the original presentation of the text, intended audience, author(s), etc. Subsequently, the texts were coded grammatically by identifying process types (actions, events and attributions). Finally, we discussed interdiscursivity (what other discourses intersect with the DE discourse), presuppositions (contestability of utterances) and word-level considerations. The final results of the day will be collated in a booklet that will be disseminated through the CDTs in due course. Special thanks to our artist in residence, Miriam, who joined us and transformed the discussions and outcomes of the day into amazing artwork! The summer school concluded with two keynotes and a panel session (Q&A). The keynote speakers were Gregory Abowd from Georgia Tech and Elizabeth Losh from the University of California. Gregory spoke “On being an applied computer scientist”, a great talk about the 4th generation of technology, “the cloud, the crowd and the shroud” (#desummer16 for more detailed accounts of this talk). The keynote on “Affect and Digital Literacy” was concerned with the challenge of making technology more accessible and the use more open. In her talk, Elizabeth considered modern-day assumptions and emotions around technology and highlighted the resulting design challenges for (educational) tech of the future. 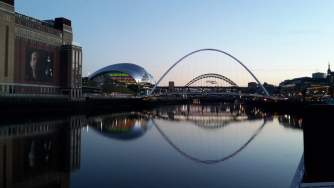 A big thanks to the EPSRC Centre for Doctoral Training in Digital Civics and the Open Lab at Newcastle University who hosted and organised the Digital Economy Summer School 2016!